The Little Panto with a Beastly Heart! Nova Radio North East’s Robert Wilson Baker reviews The Customs House’s take on ‘The tale as old as time’. A cold November’s night in South Shields was the perfect setting to start my Pantomime decathlon (oh yes I am! I’ll be seeing 10 Pantomimes between now and the beginning of February). As I said last season, I judge how successful a Panto is on the full package: songs that entertain but advance the plot, colourful sets and costumes, funny jokes and not so funny dad jokes, bold sketches but most importantly, a show that puts the audience at the heart of its story. It is heart that the Custom House prides itself on creating. The story of Beauty and the Beast is well known from both Disney’s animated and, most recently, 2017’s live action remake. This version lends itself more to the French influences with the town of Cooksonville transported to the Alps under a Winter Wonderland spell created by the Enchantress (Eleanor Chaganis). The Enchantress moulds the story, placing the cruel-hearted Prince (Steven Lee Hamilton) into his Beast form forever, unless he finds acceptance from someone before the last petal falls. Beauty (Annie Guy) and her Father, the Duke du Pommefrites (Gareth Hunter), seek the prince’s financial help when they come across Dame Bella Ballcock and her daft son Arbuthnot (Ray Spencer and David John Hopper), who in turn venture to the palace. Arbuthnot befriends a talking sheep Cutlet (Charlie Raine), who also communicates using sign language. Cutlet acts as a guardian to Arbuthnot and Beauty, who saves her from the encounter with the Gaston-like character, Gaviscon (Afnan Iftinkhar). The rest of the story follows a similar path to the familiar movie versions, The Beast imprisoning the Duke later giving a financial boost for his company in exchange for his daughter’s freedom. Beauty and Beast’s relationship blossom’s during her stay thanks to help from bubbly housekeeper Horensia (Georgia Nicholson). 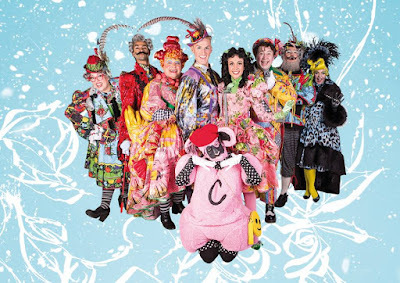 Throw in hilarity from Dame Bella and Arbuthnot mixed with Gaviscon’s turning obsession with Beauty, this Panto is packed with drama and comedy. I have mixed opinions on Beauty and the Beast as the story of a Pantomime but this production hits all the right marks to make this panto ‘the Belle of the ball’. Ray Spencer and Graeme Thompson’s script has packed as many punches with multiple topical references, humorous jokes and subtle innuendos that sit just right and old fashioned slapstick that fills the auditorium with rapturous belly laughter. The cast bring much added colour and energy to this story. Annie Guy and Steven Lee Hamilton are perfectly matched together as Beauty and the Beast. Guy more than holds her own in her Panto debut as the likeable heroine with her charming persona and delicate voice whilst Panto regular Hamilton showcases his strong stage presence and impressive vocals, especially with his Act 2 solo. Afnan Iftikhar fits into the comedic villain Gaviscon, showcasing both the humorous and sinister sides with ease. Gareth Hunter’s Duke is equally as comedic and slightly underused throughout but gets enough look in to make a noticeable impact on the plot, forming a good partnership with the infectious and bubbly Georgia Nicholson’s Horensia. Eleanor Chaganis is a very commanding, multi-layered Enchantress which allows the audience to cleverly second guess her alliance in the prologue but thaw the harshness as the plot moves on. A special mention goes to the creation of Cutlet the Sheep played by Charlie Raine. By incorporating the use of British Sign Language into the mainstream performances, it enforces the ethos of inclusion for both patrons with hearing impediments and those without who will be fascinated with the concept performed by a sassy, fun-loving character. The true stars of this show are by far Ray Spencer and David Hopper as Dame Bella and Arbuthnot. You forget that this tour de force of a duo has only been ‘Mam and Son’ for 3 seasons but it seems like 15. Hopper instantly makes the audience engaged with his child like manner, wacky humour and comedy presence. He has the potential to be up there with some of the Panto greats like Billy Pearce and Danny Adams in the future. Spencer, marking 5 years since graduating to dame, proves why he is the King of Panto and of the ad-lib. Leaving no stone untouched, his observant eye and presence will instantly send the audience into a chaos with laughter (particularly when things go wrong). The music hits the right chord with plenty of references to the 3 biggest movie-musicals this year, Greatest Showman fans will be particularly pleased. To be ever so slightly critical, the quantity of musical numbers may have been too heavy but it allowed the full cast to get chance to showcase their voices as well as engage in some golden storytelling moments; mentions go to Guy and Chaganis for a captivating A Million Dreams and Hamilton for an emotional rendition of Never Enough. The production elements this year are also particularly strong. Paul Shriek’s Costumes are even better and grander than his Great British Pantomime awarding-winning creations from last year (which fought off the London Palladium). The set, also designed by Fox and Shriek, makes the most of the small space. There is one moment in Act 2 which I won’t spoil but when combining with all the other elements in the show, proves that you don’t need big budgets to create an amazing theatrical experience. Whilst it might not have the stature of some of the other Pantos, The Little Panto with the Big Heart ensures that people of all ages and nationalities (I went with a group from my Uni course who had never seen a Panto before) can come away feeling thoroughly entertained! Beauty and the Beast runs from Tuesday 27th November 2018 until Saturday 5th January 2019. Contact the box office on (0191) 454 1234 or visit www.customshouse.co.uk.